While I was in Maine, I had the honor of working with an amazing young talent, Jesse MacDonald. 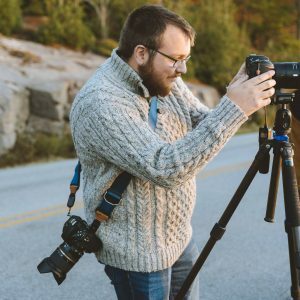 He is primarily a landscape photographer, and his last photograph inspired me to interview him so I could tell everyone I knew about him and his work. I am very excited to see where his career takes him! Kristen: So, what got you interested in photography? Jesse: As a kid I would travel a lot with my parents. They would always bring along for vacations and business trips. When I was out there I always loved taking pictures of the stuff I saw. When I got older I started seeing really really nice pictures from photographers from the same locations. It inspired me to go back to those spots and take better quality photographs of those areas. It’s always been about capturing memories for me. It’s gotten fun, but that’s what got me started. Just traveling a lot and seeing all sorts of different things. Kristen: You get to travel a lot, and I know you’re still a student. You’re graduating soon. Do you want to travel after you graduate? Jesse: Yeah, I do. I actually have a coin jar filled up about half my height that I’m hoping to fill up and take a trip for about a month or two out west in the National Parks. Kristen: That’s awesome! Have you thought about Yosemite? Jesse: Yup! That’s on the list. I want to start either southwest or south central and work my way up to Banff National Park in Canada to be my last stop. That’s the goal. Kristen: So, you do a lot of nature and landscape photography. Is that your favorite genre? Jesse: Yeah, it’s definitely what I’ve been with the longest. I’ve started to get into wildlife photography a little bit. I find that to a lot of fun and very rewarding. But, I’d say landscape is definitely one of my passions. Kristen: So what is the hardest aspect of landscape photography? Jesse: Knowing that you’re always at the will of the weather. You can be as prepared as you want with gear and getting there on time, but if the light doesn’t cooperate, you’re going home empty handed. For every shot I bring home, it’s typically two or three trips I’ve made coming home with nothing. It’s frustrating, but it makes getting the nice shots that much better. 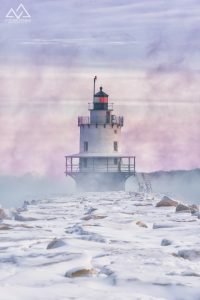 Winter Morning at Spring Point Ledge by Jesse MacDonald. Kristen: While we’re on that subject, I love this photo. I told you I’m going to redecorate an entire room, just so I can have this print. Can you tell me the process of capturing this image? It looks like it was very cold. Jesse: It was. It was. In Maine, sea smoke is not too common for us. It has to be absurdly cold for it to actually come up. So that was the first day of our first cold snap of the year. It was about -20 below that morning. It was horrendous. Kristen: Were you actually on the rocks, or did you use a long lens so you could stay safe? Jesse: I took a few steps out on the rocks, but I did use a 70-200 lens to compress the scene a little bit. If I used a wide lens, it would have just made the lighthouse seem really far away. During the warmer months, it is a lot of fun to go out on the rocks and get a lot closer. But, it was snowy and icy, and windy, so no one really wanted to go out. The morning I was out there, there was a cluster of about 25 of us, sitting at the entrance waiting to get our shot. Kristen: It would take a lot for me to get out in -20 weather. That shot is worth it, though. Jesse: Yeah. When I went home, I honestly didn’t think I was going to get anything. I’ll own up to the fact that the straight out of the camera image doesn’t have pink or purple in it. Those are actually tones that I saw from the first lighthouse I went to, I could see that one. It was around sunrise, and those were the colors I saw behind it. By the time I got over there, the sun had come up far enough it was a white out. So, I tried to make it look how I saw it when the sun was coming up. Kristen: Well that’s part of being a good photographer. You can see what other people don’t. Jesse: Yeah, I know people criticize for that much post processing, but honestly, it’s not like I was trying to make it something that it’s not. It was more so bringing back that lighthouse how I saw it the morning I was out. Jesse: Yeah, that goes back to film photography, too. People think, “Oh, it’s film, there was no photoshop then. You could dodge and burn in a dark room. You could post process with chemicals. Today it’s the same kind of process. Just digital. Kristen: Exactly. So we talked about you want to travel after you graduate. What are some other goals you have, whether personal or business? Jesse: Business, as far as photography goes, I would really like to continue adding to my portfolio, getting my work out there a little bit more. In galleries, libraries, just to get a little bit more local exposure. I’ve gotten some great feedback from the places that I have been so far. I’d like to continue with that. With graduation, too, I also need to focus on a career. It’s been a battle trying to choose either trying to make a living out of photography, or get a job that will support my lifestyle of photography. I’ve got a little bit more work to do on that decision. Kristen: Well, I hope whatever decision you make, it’s the best decision for you. I’m really excited to see where you’re going to go. Kristen: So, what’s your best advice to photographers pursuing landscape photography? Jesse: Part of it is knowing the conditions and getting a feel of what nature is going to offer to you. It’s rare to find many photographers out at high noon, because it’s just not as exciting. You really have to be willing to go out when other people want to stay inside. Whether that be snow or at odd hours of the night for stars and the moon. As far as just advice for someone looking to get into it, focus on finding what you like to shoot. You can buy expensive gear later, but just make sure it’s something you’re going to enjoy before you dive financially into, too. Kristen: I think that’s what makes landscape photography so special, because you are willing to go out when nobody else is. You can see things in a different way. If I go to a national park, I may say, “This is beautiful!” I may take a few pictures, but they won’t be at the same level as a landscape photographer, because I’m not going to be out there at 4:00 or 5:00 am. I think that’s why people love landscape photography so much, because it’s photographs of places they love, but also contain the beauty of an artist that captured it. Jesse: For someone who’s not a morning person, and hates waking up early, it’s nice to hear people appreciate it. Kristen: Definitely. So, who or what are you most influenced by in your work? Jesse: A couple things, I guess. I’ve always been influenced by other photographers in the area. Maine is home to some fantastic artists, and following their work over the years has been inspiring for my own. Seeing my work in the same groups or on the same walls as theirs has been absolutely incredible. I’ve been following a photographer who lives in southern Maine for a couple of years now. In the last year we’ve gone out several times to shoot together. Stuff like that keeps me going in my work. Photographers aside, support from my friends and my family really makes me enjoy my work that much more, too. It’s great to get feedback on it and to know that people actually enjoy what they’re seeing is always nice. Kristen: Have you ever experienced shock when your work is an the same level as other professionals? I know that happened for me, when I finally got there, it threw me a little bit. Did you ever experience that? Jesse: A little bit. It comes with it’s challenges. It’s cool to see my work get reactions and feedback that is similar to the people I’ve looked up to for years. But at the same time when it gets to that level, I’ll find myself more often than not comparing my work to theirs, too. I used to be, “Wow, their work is so good!” But, I never used to compare because it used to be so different. But now, I’ll look at someone else’s shot from the same location and think, “Man, I could have done something different or maybe I approached the scene wrong.” It;s got it’s ups and downs. Kristen: I think that challenges us as photographers, too. It’s a great way to learn. So, back to your photo of the lighthouse, did you see any other photographer’s photos of the scene? Jesse: Tons! Yeah. We have a State of Maine Photographers Facebook group, and for a solid five or six days, it was every day at least two or three days you would see photos from that morning pop up. Kristen: So, did you see any photos that made you think about the scene differently? Jesse: There was perspectives that was really cool. Instead of standing on the break water, someone photographed it from the side. They captured two silhouettes of people walking out onto the breakwater which was really kind of cool. But, with my work schedule over break, I had to wait a few days for the cold snap. The day before I went out, a photographer I’ve looked up to for some time posted an extraordinarily similar shot to the one I wanted to create. Same composition, same kind of perspective, and I had that shot in the back of my head for about a week. I know I wanted to go out and capture that view. After I saw that, I thought, “Alright, well. How do I do this differently? How do I do this better?” It threw me off, because while I was setting up or shooting, or even editing, I was thinking, “This is what they did.” It shouldn’t have been my train of thought, but it’s hard when you see so much from the same area. It’s tough to set yourself apart from other people’s work. Kristen: I think that goes back to influencing each other. I have shots from photographers that I love. I go through magazines and rip out pages if I like the posing or lighting of an image. So there is no shame in having a similar setup and putting your own spin on it. Jesse: Yes. I also found out our images were processed very differently, so it did set it apart like that. Kristen: This makes me want to go out and discover landscape photography. If you could photograph any other genre what would it be? Jesse: I would probably have to say portraiture. I’ve done it a couple of times, and tagged along with photographers for shoots. It’s fun to work with other people. I love landscapes, they’re a blast, but mountains don’t talk. It’s nice to get out there while you’re actually photographing someone, you get to work with them, you get to know them. So, that dynamic makes it that much more fun. Once you get to know them on a certain level you start to get these wonderful candid moments. One of my friends at college, she modeled for me for the afternoon. I got to practice off camera flash and black and white photography. We got some cool shots come out of it, but my favorite from the whole day was a candid of when she started laughing, and it was fun. Fun and light hearted. I’d love to get more into that. Kristen: Cool. So we as creatives, when we first start don’t realize we’re not alone. We go through a roller coaster of emotions, and self doubt. Are we good enough? Yes, we’re good enough. This is awesome! Then we feel like frauds at times. Have you ever been through that, and if so, what lifted you out of it? Jesse: I’ve definitely gone through a lot of ups and downs like that. Comparing my work to others. It’s okay to draw inspiration from other photographers. As far as comparing your work to someone’s, you really should just compare your work to what your work used to be. Not so much what other people are shooting. Because every photographer is different, every artist is different. People need to move at a pace that’s comfortable for them. I might go through a couple weeks when I go out and just not get what I want, and ask, “Man, have I lost it?” Photography, or any art, is just a long road. It’s not all going to be great. It’s not all going to go how you want to go. You just have to work hard and work thorough it. Kristen: That reminds me of a quote that says, “Don’t compare your chapter one to someone else’s chapter 20.” I’m excited to see you grow and what you’ll bring to the world of photography and art. Thank you for taking the time to answer my questions today! Did you want to throw in a plug for your website and store? Kristen: Awesome. Thanks so much, Jesse! A special thank you to Jesse for sitting down to do an interview! Follow Jesse’s work on his website and social media!